I just found your site today and am looking forward to exploring it. I was excited to see the cover photo on Taipei Escapes 1. Bitoujiao was the very first hike I did on my own when I arrived in Taiwan in 2008, and I’ve returned several times. There’s some mystical force that draws me there. Bitoujiao (and nearby Longdong) are peobably my favorite bits of the coast in Northern Taiwan, despite all the tourists. A very special place. Hope you have fun exploring! Hope you give Mt Bijia and Huangdidien a second chance some time – they’re great walks, and getting to the Bat Cave isn’t quite as difficult as I made it out in the book. Good to see you love the Sandiaoling Waterfall Walk and Teapot Mountain/Mt Banping hike (in November – hopefully the silvergrass was in full bloom) so much – they’re two of my favorites as well! I can’t find any information about where to buy the books Taipei Escapes 1&2. This summer I am going for the second time to Taiwan and I would like continue discovering the north. Just discovered these books and ordered them. Really hope they arrive before leaving for Taiwan in two weeks. Thanks so much! Hope the books arrive in time and you have a great time exploring this great part of the island! Can’t wait to go hiking near Taipei as I didn’t have enough time for it last time. The three books arrived already on Friday. Big praise for Grace Ting for the handling and efforts she put into it. 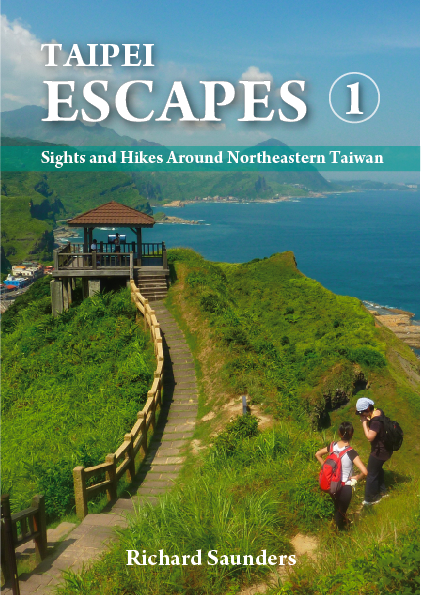 Books are looking great and I’m pleased to see the Taipei Escapes books include some trips I made during my first stay already. Thanks very much for ordering the books – hope you enjoy them!